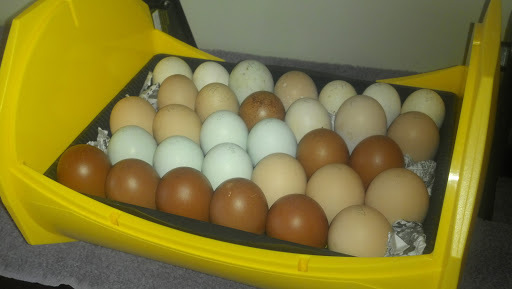 We've been collecting eggs all week from three of our hens we wanted to breed, combined them with some shipped eggs that my friend Autumn purchased, and put them in the incubator today. Of the group, 16 came from our hens (resulting chicks will be 5 full black copper marans, 6 bcm x pink EE, and 5 hopeful olive eggers) and 15 from a breeder (Cochin, Ameraucana, marans, silkies, silver Phoenix, Yokohama, and a few unknown mixes). Hatch day is March 24. What kind of incubator do you have? I've never seen one this size. I would love to hatch chicks. We have a Brinsea Octagon 20 Advance and LOVE it. Bought it straight from Brinsea (watch their facebook page for regular discount codes). Ours has been very stable with temp & humidity.